"The next morning we rose at dawn and went for a ride around the lake in a dug out fishing boat. That is the perfect time of day to go. I highly recommend it. When we got back, one of the elephants joined us for breakfast! Fun to watch him being fed cane by one of the motel waitresses!" Dak Lak - is a province in the Central Highlands (Tay Nguyen) in the country. It's 320 kilometers from Ho Chi Minh City and 194 km from Nha Trang. 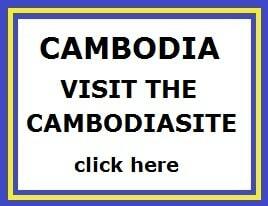 In the west it borders Cambodia, and the border has a length of 193 km. 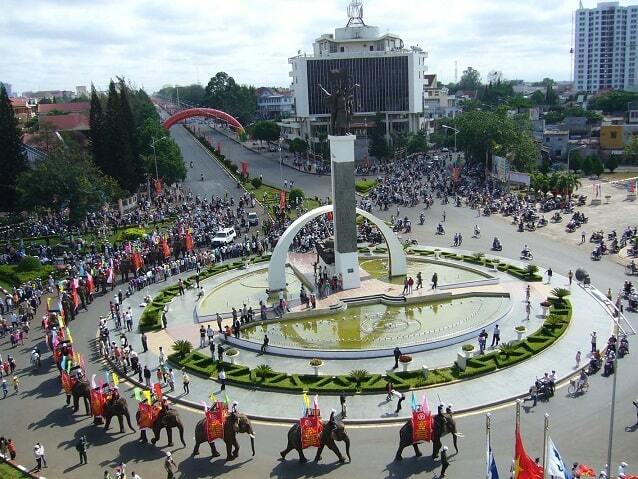 The capital Buon Ma Thuot. In the centre of Dak Lak is a plateau: the Tay Nguyen plateau, which is a region of majestic rivers, lakes, mountains and rainforests. It is the home of several dozen ethnic minorities, whose tradition is to worship nature. Dak Lak is a place where nature is respected. There are two major National Parks: the Chu Yang Sin and Yok Don. There are also impressive waterfalls, such as Gia Long, Krong Kmar, Thuy Tien and the Bay Nhanh. These are natural attractions, that you must visit. 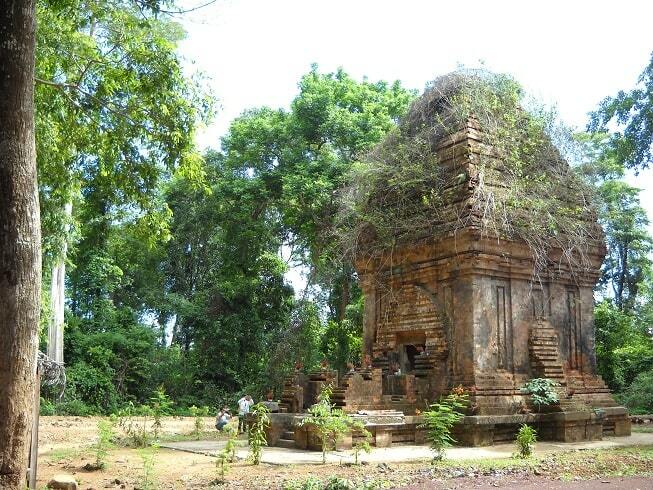 For a bit of culture you can visit the Yang Prong Cham Temple Tower and religious centre Tam Linh. 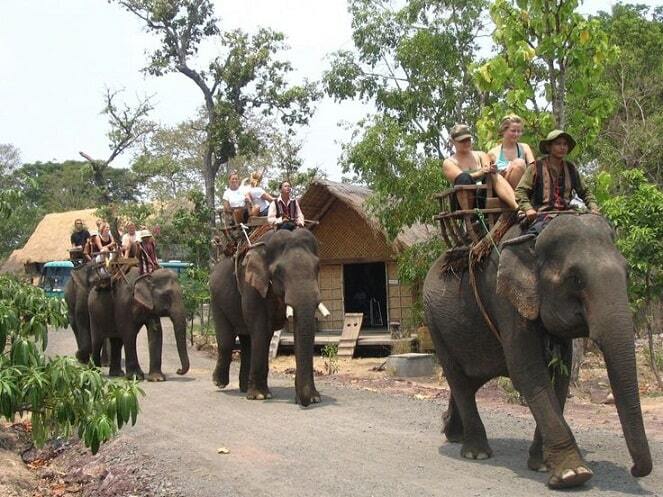 Last but not least, go out in Dak Lak for an Asian elephant ride. This is the area to do it. Special in Ban Don. Buon Ma Thuot, the capital, is situated at an altitude of 536 m and is the largest city in the Central Highlands. The city has all year calm, cool weather during the year, with an average temperature of 23 � C. The city has the most luxurious markets. It's the administrative, cultural and economic center of the region. Also, Buon Ma Thuot is the center, where all roads converge the different provinces. Buon Ma Thuot is famous for its many kinds of fruits, vegetables, and especially coffee! Buon Ma Thuot in Vietnam monopoly in terms of coffee. This is not surprising, because there is found no serious competitor in Vietnam. It is said that you never can drink such a good robuusta coffee as in Buon Ma Thuot. If you visit Buon Ma Thuat today, you'll see a city with wide roads, decorated with green trees and beautiful flowers and many new residential complexes. The city is developing rapidly. What develops most rapidly, is tourism. The province seems to be discovered by tourism. There are few tourist attractions in the city, but the people are friendly, the coffee is great, and a stop here is worthwhile. You act off the beaten track and experience the Vietnamese life that still is not about tourism. The only Cham Tower in Central Highlands is the Yang Prong Tower and it's situated at a distance of 100 km from Buon Ma Thuot. This was built in the late 13th century to worship the God Shiva (also Mukhalinga). Yang Prong Tower is built of red ceramic bricks, resting on a foundation of blue marble stones. The tower is nine meters high with a square base. Although it seems that there are four "doors" it has only one. This "door" looks to the east into the kingdom of the gods. The other three "entrances" are located at the other three sides of the tower and are not open. The upper part of Yang Prong has a giant conical roof, from which visitors can see freely across the landscape of Central Highlands. The Ea Kao Lake is 12 km away from Buon Ma Thuot. The area around the lake is full of green plants and colorful flowers. In addition to enjoying the scenery, there are also a variety of cultural events and other fun activities. There are also here: an amusement park, hotel, flower gardens, restaurants, children's playgrounds, campgrounds, etc. These are all logical and attractively decorated for visitors. There are forty-four ethnic groups living in Dak Lak. The Cuisines are often a collection of various dishes from three different parts of Vietnam: North, Central and South. Besides being delicious dishes, such as grilled chicken Ban Don and you should drink the Ama Kong's Wine. In Nha Trang you should visit the Long Son Pagoda Do not miss the Thai Nguyen Street. This striking pagoda was built in the late 19th century and is situated on a hill (a climb of 152 steps). The entrance and roofs are decorated with mosaics of dragons, which are made of glass and ceramic tiles. Behind the pagoda is a huge white Buddha seated on a lotus flower. Around the base of the statue are busts of Thich Quang Duc and six other Buddhist monks deceased by self-immolation in 1963. 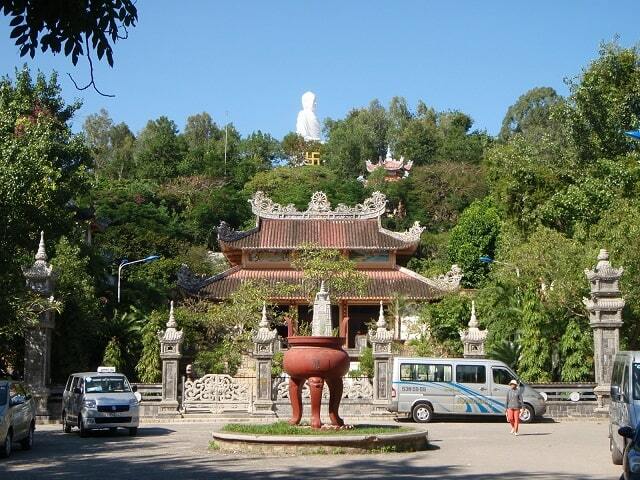 Around the 14-meter high Buddha have a great view of Nha Trang and the surrounding region.